My head is swimming and twisting around the different concepts that this verse can be applied to, and which direction I should go for the sake of this blog entry. I think I will attempt to cover a few different areas. That is what “ponderizing” is about, right? Firstly, our perspective is limited. Our notions of time, what is truly important, what it is we need to experience in order to grow, what will make us happy etc….are all constrained by our mortal vision and understanding. It is very easy to get wrapped-up in the “now”—who we presently are, what our struggles are, what choices we have before us etc…. We tend to be focused on immediate desires, results, consequences, emotions, fears, goals—essentially elements that are directly on the table before us, and within “view”. It can be difficult for us to grasp the concept of eternity, let alone to understand the reasons behind our experiences, tests, and trials, or how far-reaching the choices that we make now can truly be. In the daily commotion of trying to pay bills, navigate relationships, and reach for goals… everything tends to be centered on our immediate perspective and impression of what we think we need, and what appears to be important. However, that limited viewpoint can often cause us to make mistakes, lose sight of what is truly important, and to even lose our faith…. and our hope. Mortal ambitions. There are many things that we strive for that ultimately have no importance in our eternal progression—essentially the things that “you can’t take with you”. We seek, and desire wealth, material items, fame, “power”, physical beauty, and immediate pleasures/ gratification (in various forms). Our mortal world constantly promotes that these are the things that will make us happy, and thus are what we should endeavor to achieve. We want to live in comfort, to have stylish clothes, to impress others, to have an attractive person on our arm, to achieve this or that rank within our social circles and work places etc….but really, most of it is temporal, and even shallow. It is stressing importance on our existence in the limited “now”, and on the opinions, and admiration of others. Would Heavenly Father be impressed by the size of our bank accounts, social status, our external physical beauty, or how much temporary gratification we were able to achieve? Of course not. And yet, when we limit our focus to the now, and only what we immediately can see around us (what we desire, and who we want to please and impress)…..that is when we often get pulled off-course from what we should truly be achieving. Ultimately, what matters most is how we live, learn, improve, and grow. It is about the beauty inside of us, the good that we do, the people that we help, the families that we create, and the love that we give….and most importantly, it is about striving to follow the example that Christ set for us. A small, over-looked person (who does not seem like much to mortal societal standards) may achieve more eternally than someone who focuses on wealth, beauty, and immediate “temporary” achievements and ambitions that will end with their physical death. We can take internal growth and beauty with us…but not temporary achievements, or external shiny “things”. Tribulations. During times of struggle and heartbreak it is easy to feel that we are forgotten, or that we maybe are even being punished, or betrayed in some way. It can feel like everything for us has ended, is broken….and like we will never be able to recover. We can become incapable of seeing how anything good can come out of a dark situation. We may even question our faith, and think that we are alone. In truth, it is through those experiences that we learn our greatest lessons. It is how we discover what is right, and what is wrong for us first hand….. it is how we build our inner strength and faith, and it is also through our hardships that we discover true appreciation, and perspective for what matters most. We learn patience, and even compassion for others and their struggles. Trials refine us, thus our experiences are tailored specifically to challenge us, assist us in overcoming our struggles and faults….and to help us to learn, improve, and grow— and hopefully progress on paths that will lead to greater eternal destinations. However, when we are in pain, all of that can be drowned-out. It can be difficult to trust that something good can be gained—even in the form of knowledge, or self-improvement. Yet, after time passes, it can be shocking to look-back, and see that what happened was truly for the best—that somehow we ended-up spared of something that would have been harmful for us, and directed towards something better… or that we learned crucial things that ultimately guided us into being a better version of ourselves. Just as we sometimes apply tough love to those we love ( and let them fall so that they can learn), so too does Heavenly Father at times perhaps see that as a necessity to help us grow, see things with more clarity, and to discover the eternal paths that lead towards Him. Grief. The loss of a loved one can be devastating…. as I well know. It can seem like they are forever lost to us, and that we will never see them again. Even if we can grasp that we will be reunited, it seems like something that will take so long….so we still lament. It is natural, especially when we deeply love someone. However, what seems so long to us, is really a blink—a small particle—in the scope of eternity. Our grief, and time without them is temporary, and our eventual reunion will be eternal, and vast in a way that is impossible for mortal perspective to grasp. Love continues, there is no end. I remind myself of this every day, and every time I feel the ache of the piece that is missing from my heart. People. This may look like an odd area to correlate, but really it applies. 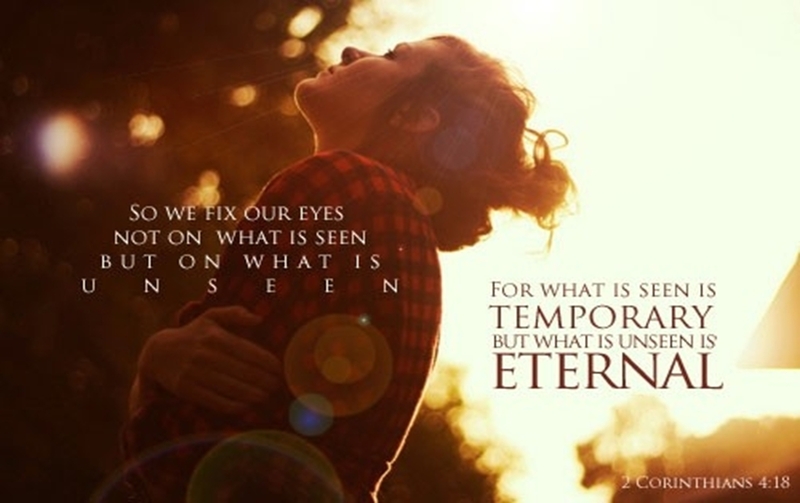 So often we view, and determine who people are via their physical appearances, or initial impressions (thus, what is “seen”and temporal), and fail to see what is inside of them, and who they truly are (the “unseen”, and what is eternal). I would be lying to say that I myself have not made that mistake before, and I suspect most of us have done it. The same mechanism works in opposing ways. We may look at people from limited standpoints, and dismiss them based on surface factors that obstruct our own selves (via the restriction of assuming we “know” them, and our lack of desire to discover anything else) from being able to see their inner beauty, talents, and positive offerings. In reverse, we can be deceived by physical beauty, and by what we want a person to be—we can literally choose to see, and hear only what we want to believe, even if it means putting blinders up against seeing what does not fit with our desired beliefs of who they are. We find ways to twist and excuse-off the things that we do see— including behaviors or selfishness that could actually reveal inner “ugliness”, or anything that is even harmful for us. Trapping our perspectives in this way, and placing importance on temporary factors ( can’t take our bodies with us, and they wither even in our mortal lifetime) results in harming our own selves in the form of missing-out on the truly beautiful elements within people, as well as putting greater value on packaging in ways that can create self-deception, and turmoil (once true contents are revealed, and consequences happen). We simply get locked-down in wanting to only see what we want to see/ believe, and then deny it when they present things that oppose what we want to see and hear. Relating to worldly as opposed to spiritual affairs; secular. Synonyms: secular, nonspiritual,worldly, profane, material, mundane, earthly, terrestrial. 1. Of or relating to time. 2. Pertaining to or concerned with the present life or this world; worldly: temporal joys. 3. Enduring for a time only; temporary; transitory (opposed to eternal). Lasting or existing forever; without end or beginning. Synonyms: everlasting, never-ending, endless, perpetual, undying, immortal, abiding, permanent, enduring, infinite, boundless, timeless, “eternal happiness”. 1. (of truths, values, or questions) Valid for all time; essentially unchanging. 2.Characterized by abiding fellowship with God. Sometimes, I find that it helps to directly look at definitions, especially when it comes to making comparisons. Even when you know the definitions, juxtaposition has a way of snapping everything into a sharper, more defined level of focus. The contrast between these two words is vast. What strikes me are the synonyms. Temporal—nonspiritual, worldly, profane. Eternal–everlasting, abiding, infinite, “eternal happiness”. Looking at the two in this way seems to make it so clear and simple as to what we would really want to achieve and focus on….and yet due to the noise of the world, our immediate desires, and our limitations of basing things off only what we can see “in the now”…. the simple truth can get drowned-out, and even forgotten. Ultimately it is our choices that determine not only character, but also whether our feet take us down a short path that will quickly take us to a dead-end……or a path that continues forever, and leads us to true lasting blessings, happiness, love…and Him. Our mortal perspective, lack of patience, and immediate desires can tempt us to reach for the things/choices that are temporary. In our desperation to fill our “hunger”, we essentially become willing to sacrifice a never-ending feast in exchange for one tiny little morsel of temporary fulfillment and pleasure/ happiness. However…what happens once that morsel has been digested, and maybe even has made us sick? The table in front of us will be empty, and so too will be our cramping stomach. Yet, if we are willing to wait, trust, and focus on what will be lasting….we will get to sit at a table loaded with endless bounty, and never again will we have to endure a moment of hunger. Likewise do these results apply when we make our choices with everlasting goals in mind. Temporary pursuits can twist back around on us and cause damage (in addition to leading to emptiness)—our rush for pleasure and happiness can result in far greater pain and hardships than we had even been able to fathom previously (despite whatever desperation caused us to make those kind of choices). We could end-up making yet more damaging temporal choices one after the other in our attempt to “fix” things, ease our discomfort, and to once again grasp at a shred of fleeting happiness….and we can become blinded by our own lack of eternal perspective, and by the intense need, and emptiness created within us due to our narrow vision, and the resulting misguided choices. Sometimes we have to dust ourselves off, be honest with ourselves, and retrace our steps. We need to figure-out where it was that we went wrong (and why–to prevent us from blindly doing it again), and first stepped onto the wrong path. We then need to start anew— in the right/ eternal direction. We have been blessed with the atonement, so there is no amount of distance that we cannot turn back from, and renew ourselves—and re-direct our ultimate destination. The trick of course, is being able to determine what choices will lead to things that are temporal, and which will lead to eternal. We are very clever at deceiving, and convincing ourselves that temporal pursuits will somehow actually benefit us eternally—especially when we have strong desires, or even pain within us ( no one ever wants to admit to themselves that what they are reaching for is temporary, or even bad for them… and we typically do not aim for it on purpose). Our pressing needs, desires, and worldly definitions of values cloud us—they are what we directly “see”, so it can be difficult to keep focus on the “unseen”. It is almost like magic. Simply trying to look at myself from His vantage point forces me to be honest with myself—almost instantly. I find that I cannot uphold my inner deceptions, and that things are put into a greater perspective. At times I have even felt ashamed, foolish, and embarrassed to have not seen the truth of my own mistaken beliefs and actions sooner…because it suddenly becomes so obvious, and clear. Knowing that I cannot hide from Him, forces me to stop hiding from my own self. It helps me to correct my mistakes, be honest with myself (and Him), and make better choices from a much broader viewpoint. Its all about discovering what can help us focus on the truth of what is truly important, and eternal. We have to learn how to overcome our impatience, “hunger”, and self-deception in order to wait for, and choose what will result in everlasting happiness.